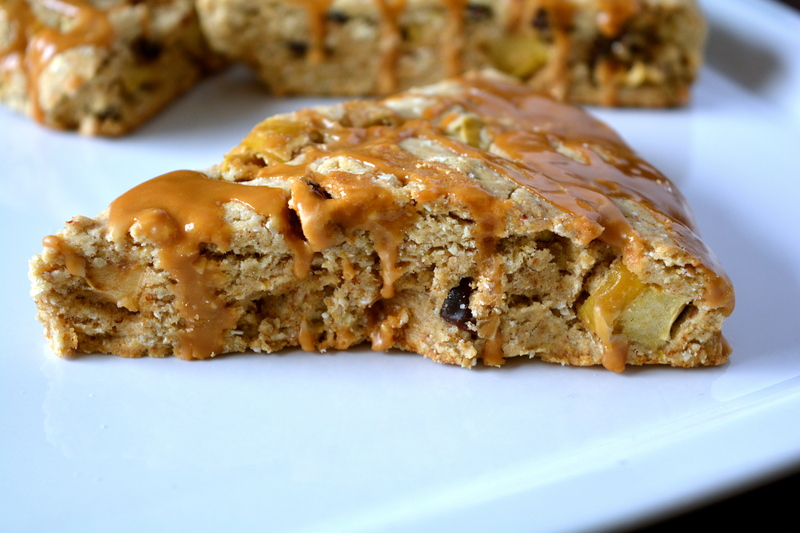 Light, flaky scones with a double dose of apple and sweet raisins. These are also delicious without the glaze, and dipped into pure maple syrup for a sweet morning treat. This recipe was developed for Cuisine Soleil, a Canadian-based gluten-free and certified organic flour company that produces over 12 flours and a variety of mixes. Here I’m highlighting their buckwheat flakes, a light flake similar to quick-cooking oats, with an earthy buckwheat taste and a lot of versatility. To make the scones, put the buckwheat flakes, sorghum flour, tapioca starch, millet flour, sugar, xanthan gum, baking powder, baking soda, and cinnamon in a large bowl. Whisk well to combine. Using a pastry cutter or two knives, cut in the vegan buttery spread until it is mixed in with the flour mixture and about the size of peas. Stir in the apples and the raisins. Drizzle in the applesauce, a little at a time, just until the dough comes together, using your hands to knead it together. Pat the mixture into to about 7-inches in diameter, then cut into 8 triangles. Pull the triangles apart slightly. Bake for 15 to 18 minutes, until firm to the touch and just turning golden on the edges. Cool on the pan for 5 minutes, then transfer to a cooling rack to cool completely. To make the glaze, put the icing sugar in a small bowl. Stir in the maple syrup and, if your maple syrup isn’t very strong, add the maple extract, too. Add in just enough nondairy milk for a drizzly consistency. Drizzle over the cooled scones.